+ Marie Pugh Culpepper, 15 May 1927 - 31 Dec 1993. Online edition, Jimmy Dale Culpepper Obituary, Saturday, February 07, 2004. + Dewey Flynt Culpepper, Sr., US AIR FORCE KOREA, 14 Oct 1929 - 28 Dec 2005. Rankin County News, Brandon, Mississippi. Obituary of Dewey 'Bubba' Culpepper, Jr., published 30 Aug 2006. Newspaper name and publication date unknown. Codie Culpeper, Boarder, M, Wh, 21, sng, MS/MS/MS, Laborer, General Farm. Obituary* 2 Nov 2012� Purvis Culpepper - Carthage. A well known businessman and entrepreneur, Joseph Purvis Culpepper, born May 5th, 1928 at Lena, MS passed away at Baptist Medical Center in Jackson, MS at the age of 84. Born to Joe Culpepper and Susan Viola James Culpepper, he is a graduate of Carthage High School class of 1948. He furthered his education at East Central Junior College and Mississippi State University graduating with a Bachelors of Science degree in accounting. He is survived by his wife of fifty-nine years, Lafaye Newsom Culpepper and their children, Renee Culpepper, Alan (Scooter) Culpepper and Corine Culpepper. He is also survived by four grandchildren, Eric Lutts, Luke Culpepper, Sarah Beth Pierce, and Mary Grace Pierce. He was preceded in death by one grandchild, Lacie Culpepper. Mr. Culpepper was an active member of the Carthage Church of Christ. He also was founder of Leake Academy where he served as a member of the Board of Directors from 1970-1982. He was an active member of the business community and owner of many businesses throughout his career, including C & S Furniture, Culpepper Mobile Homes, Culpepper Insurance Agency, Better Built Homes, American Family Housing, Nationwide Mortgage, C & D Enterprises and Budget Furniture. He also played an integral role in economic development in Leake County and strove to encourage the growth of the economic community. In his later years, he was well respected and sought out by many young businessmen for his advise and expertise. He was an eternal optimist and rarely, if ever, voiced complaint or accepted defeat. He remained cheerful throughout his life and always greeted those he met with his unique jovial personality and a smile on his face. He was an original character and brought joy and laughter to those he encountered each day. The Carthaginian, Carthage, MS, 16 Jan 2014, courtesy of James Cody Culpepper Jr.
Robert S Culpepper, born 1925 in MS, White, Single, Education: Grammar School, Height/Wt: Unk; Resided in: Newton Co., MS; Enlisted 3 Jul 1943 at Camp Shelby, MS (Drafted). Obituary of Tommy F. Culpepper (#59482), published 2 Feb 2007. Obituary* 31 Oct 2010� Ellen Culpepper Truhett Miles, age 82, of Gulfport, passed away on Sunday, October 31, 2010, in Gulfport. Mrs. Miles was a school teacher for 32 years. She spent 26 years at Bayou View Elementary. She was a member and officer of Delta Kappa Gamma Teachers Sorority, Past President of Gulfport Teachers Association, member and officer of Gideon's Auxiliary International, and an active member of First Baptist Church of Gulfport. Mrs. Miles was preceded in death by her first husband, Riley Leon Truhett; her parents, William and Pearl Culpepper; and her siblings, Calvin Culpepper, William Lee Culpepper, and Elizabeth Pearl Culpepper. She is survived by her husband Claiborne "Clay" Miles of Gulfport; son, Joe Truhett and his wife Joni of Bainbridge, GA; step-daughter Beth Miles White and her husband Tony of Gulfport; sister Bessie C. Kelley and her husband T.O. of Waynesboro; sister-in-law Mattie Ola Culpepper; and five grandchildren, Thomas Truhett and his wife Jennie, Jill Truhett, Rachel Truhett, Marcus Truhett, and Alex White. 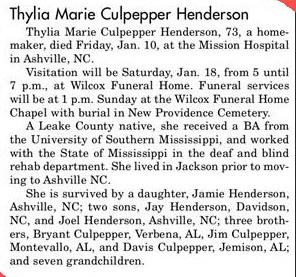 Marion Howard Culpepper and Mary Kathryn Parrish are the parents of Ellen Leigh Culpepper, Female, born 1968 in Wilson Co., NC. My name is Jeff Joyner a decendant of Wiley and Tempie Joyner.On your site I saw that it stopped with Hardy Joyner and you may already know this but just in case,Hardy Joyner father was Lewis Joyner born 1755 and died 1825 wife is unknown and they had 9 children,Lewis Joyners father William Joyner born 1719 in Nash Co. and died in St. Mary's Parrish in Nash Co. on 17 Feb. 1785 wife was Celia Sealey b 1722 in Edgecombe Co. and died in Nash Co. in 1800 had 12 children.William Joyners father was Abraham Joyner born 1680 in the isle of wright, Virginia and died 9 July 1728 his wife was Ann Dawson and she was born 1705 in the isle of wright,Virginia.Abraham Joyners fathers name was also William Joyner and was born 1658 in the Isle of Wright,Virginia and died at same place on 21 May 1698 his wifes name was Mary Brody and she was born 1655 in the Isle of Wright Virginia British Colonies and died 17 Jan. 1727 in the Isle of Wright Virginia British Colonies.The first William Joyner father was Thomas Joyner born 14 Nov. 1619 in Bere Regis,ship Dorset England emigrant 1646 for Northhampton VA and died 21 may 1698 and wife was sarah edwards born 1623,Thomas Joyner's fathers name was also Thomas Joyner and was born 1595 in Bere Regis,ship dorset England and died 1657 and wife was maude born 1599,I would be interested in speaking with you.Was Tempie Ann Joyner an Indian or part Indian?I have pictures of her in traditional indian attire in her early years and have other pictures,some members of my family put all this together,my uncle and a lady named gayle and I apologize her last name I can't remember right now. E-mail written Jun 2009 to Warren L. Culpepper from Jeff Joyner, e-mail address.